The Independent Lubricant Manufacturers Association (ILMA) recently invited NORA to draft an article for their Compoundings Magazine. ILMA is the voice of companies that produce more than a quarter of the nation's lubricants and three-quarters of its metalworking fluids for customers who use their products to improve performance and increase efficiency. 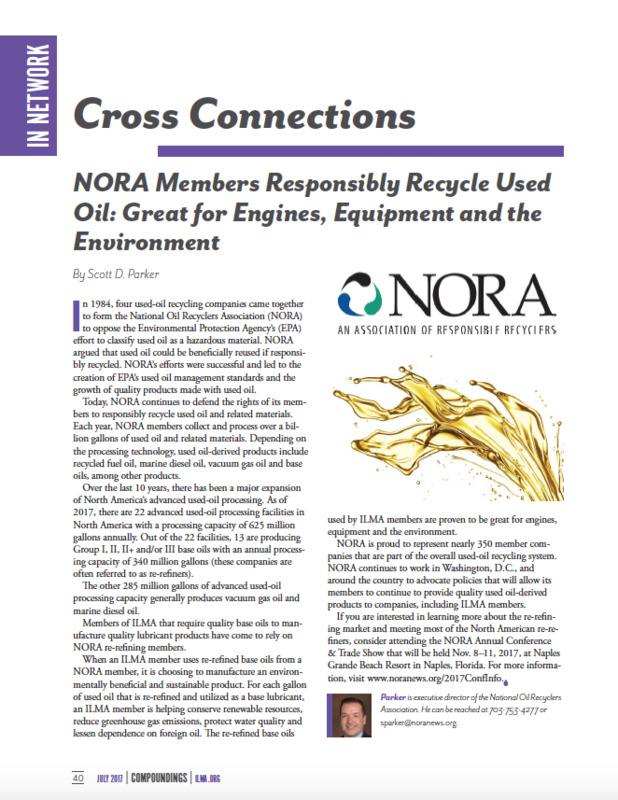 NORA’s article entitled “NORA Members Responsible Recycle Used Oil: Great for Engines, Equipment and the Environment.” The primary message of the piece was that the vast majority of providers of advanced processors of used oil are NORA members. In 1984, four used-oil recycling companies came together to form the National Oil Recyclers Association (NORA) to oppose the Environmental Protection Agency’s (EPA) effort to classify used oil as a hazardous material. NORA argued that used oil could be beneficially reused if responsibly recycled. NORA’s efforts were successful and led to the creation of EPA’s used oil management standards and the growth of quality products made with used oil. Today, NORA continues to defend the rights of its members to responsibly recycle used oil and related materials. Each year, NORA members collect and process over a billion gallons of used oil and related materials. Depending on the processing technology, used oil-derived products include recycled fuel oil, marine diesel oil, vacuum gas oil and base oils, among other products.